In week three of Aniston of the Week, we look at another Friends era film. In 2000, the Madonna vehicle, The Next Best Thing (John Slesinger) would present the straight woman and gay man raising a chid scenario, with mainly terrible results, but two years prior, Jennifer Aniston starred alongside Paul Rudd in a superior film on the same subject, directed by The Lady in the Van’s Nicholas Hytner. PLOT SUMMARY: Nina (Aniston), a Brooklyn based Social Worker and George (Rudd) a private school primary teacher meet at the former’s step sister Contance’s (Allison Janney) house after the latter’s success directing the school play. The two become friends and move in together when George’s boyfriend breaks up with him unexpectedly. When Nina falls pregnant by her outspoken boyfriend Vince (John Pankow), she decides she would rather raise the child with George, which causes tension between them, not least of all because her feelings for George are not purely platonic. CHARACTER TRAITS: Super, super kind, thoughtful, nurturing, intelligent, optimistic but with low self-esteem. 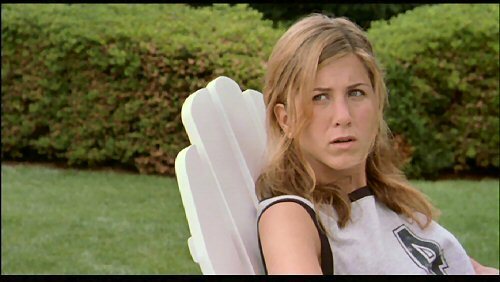 NOTES ON PERFORMANCE: This was perhaps the first film role in which Aniston could be seen in unglamorous mode, as Nina is a low-paid, socially conscious, ‘average’ person. As a result, Aniston is fairly subdued, convincing as someone who would spend their time with Vince, rather than find someone less egregious. She’s restrained and deeply sympathetic during scenes when she bares her heart to George, ultimately giving a very strong, relatable performance. NOTES ON FILM: The Object of My Affection, despite the convincing leads, seems to exist in a pretty idealised world. Nina’s community centre is portrayed as the kind of place where sexual health advice given to insecure teens is all that’s required, and the stereotype of the overweight outspoken downstairs neighbour in George and Nina’s building is enough to convince us that they live somewhere ‘real’. A certain awareness of this unreality is indicated by the references to Hollywood musicals, as George and Nina are compared to Gene Kelly and Debbie Reynolds in Singin’ in the Rain in a scene at their lovely community dance class. Everyone in the film seems to believe in the film and gives spirited performances, especially Rudd, and Nigel Hawthorne as the elder professor also experiencing unrequited love. All this contrives to elicit warm fuzzy feelings about the cast and overlook the super sappy happy ending, in which an interracial couple, a gay man, his boyfriend and the biological father all form the core of one sweet little girl called Molly’s family. Hooray!